If you haven’t noticed, we don’t publish articles about Vladimir Putin. At least not regularly. In the past year, oDR has published only three articles on Russia’s leading man. If you compare this figure with most websites covering developments in the post-Soviet space or even national news, it’s a small share. There are several reasons for this. For a start, there is more than enough coverage about the doings and beliefs of Vladimir Putin in the press, whether it’s published in London or Moscow. By contrast, Russia’s regions are largely ignored or patronised. Putin is important. Over the past 15 years, he has gained (and been given) a dominant position in Russia’s political economy. The name “Putin” is symbolic with stability, a resurgent Russia. In effect, you can’t understand Russia without him. But at oDR we’re interested in covering what’s left behind by mainstream media — both inside Russia and out. 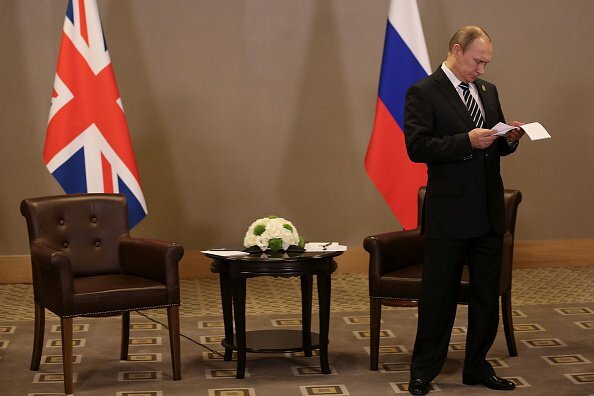 In The Putin Mystique, Anna Arutunyan describes a meeting with the Russian president. “I have suffered his dreary aluminium stare for a total of about thirty seconds. I found no soul there, nothing ‘interesting’ at all,” she recalled. The Putin Mystique does not end with its lead character. The author instead focuses on the political system which allows for the sacralisation of state power and its personification. In short, modern Russia’s endemic corruption and a deeply entrenched patrimonial state are the very bedrock of this system. And they predate Putin. Putin may not be a “reactive” president as Mikhail Zygar writes in his latest book — he does have beliefs, convictions and a style of rule — but he’s the arbiter in a complex system of elite checks and balances, rather than a classical “dictator”. Corruption, after all, isn’t just a socio-economic ill: it’s a form of elite management too. November 2015: Vladimir Putin at the G20 Summit in Antalya, Turkey. (c) Chris McGrath / Getty Images. All rights reserved.But the Kremlin’s decision-making process is more than opaque. At times, second-guessing is useful, yet it also creates false, distorted picture of how Russia works. Articles about “what Putin’s up to” reflect a lack of knowledge, rather than a surfeit. In this sense, the media’s focus on Putin not only buys into Kremlin PR, but replicates faintly orientalist forms of knowledge about Russia’s “eastern despotism”. All culpability for political failure or success cannot rest on a single figure. Russian state media have lambasted western journalists for their obsession with the President; we are happy to oblige them, though not for the same reason. The image politics, the photo shoots, the temporary disappearance — all the attention on Putin hides a more compelling and worrying reality of a country beset with crumbling infrastructure, rooted in corruption and indifference, and one that is deeply, deeply unequal. To link this solely with Vladimir Putin is to miss the story of how this came to pass. There may be a whole legion of influences on Putin’s political style, from nationalist philosophers such as Aleksandr Dugin and Ivan Ilyin to his bittersweet experience as a KGB officer during the twilight days of the GDR. Yet Putin’s power vertical is remarkably self-perpetuating, as signals sent from the top are interpreted by overzealous administrators and bureaucrats. The leader who can only be misled by his corrupt advisors — but cannot misrule himself (for it’s invariably a he) — is part of a long, ignoble tradition in Russian statecraft. The man at its summit can take the credit for its successes and keeps just enough distance from its failures. Instead, we wish to untangle the Russian elite’s continuing efforts to estrange the demos from political participation in their pursuit of a state capitalism which is both corrupt and authoritarian. We need to report on the possibilities, however slim, for horizontal mobilisations against arbitrary power. And most pressingly, we need to continue holding the Russian authorities to account for their systematic violations of rights, whether socio-economic, political or human. Since its inception, oDR as a project has been committed to covering political developments both from below and the regions. Rather than of-the-minute sensation, oDR is interested in how things work out over the long term. For us, the constant focus on Putin erodes internal agency and dynamics within the Russian political and social spectrum, eliding everyday experiences and trajectories — whether in the centre or the regions. As a recent article by Natalia Zubarevich explains, this knowledge gap is detrimental to our understanding of how the Russian elite creates legitimacy domestically, manipulating social divides across regions. The trials faced by people living in Russia’s regions have long been portrayed as an ethnographic rather than a political feature. Inside the Moscow Ring Road, the widespread “patriotic” understanding of “hard times” as endemic to Russian provincial life (why should they expect any better?) is a mirror image of the “new Kremlinology”. Both visions deny agency to ordinary Russians trying to scrape by. In this respect, we regularly work with activists and journalists from across Russia to bring stories that are otherwise left behind — such as the dislocations an international pipeline visits upon communities in Kalmykia, or attempts to prevent Bashkortostan’s ancient hills being sold off for gravel. As another initiative, the Russian Reader blog, illustrates, such stories from the “periphery”, if properly contextualised, are actually not so “peripheral” after all. The rise in activism and labour protests in the regions suggests that people’s patience is not inexhaustible, whatever patriotic soundbites are thrown their way. Indeed, the brunt of the blow that Russia’s elite has struck against its own people has been born mostly by constituencies outside Moscow and St Petersburg. As Russia’s economy tanks further, high-quality coverage of the regions will be crucial to understanding what has happened to the world of work and democracy in Russia. Putin has had a hand in this, but let’s not give him too much credit.